With Keramag Joly washbasin everything runs smoothly in your bathroom. The main features of the Keramag Joly wash basin and WCs are not only the small dimensions, but also the round shaping - ideal for small bathrooms or the guest WC. 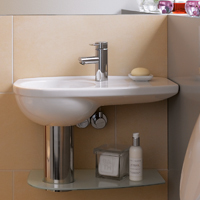 The Keramag Joly washbasin in combination with the Keramag Joly siphon cover creates a lot of design in a small space. The series also offers Keramag Joly toilet seats in round form with or without softclosing.